i went through the roof towards bleached and slashed denim jeans when i saw mr. freddy, a 7-month old baby, own one. i'm so envious of him. i stressed out myself to own two and not one only! rofl. i pulled out my denim jacket and jeans then started doing random slashes. then, i crazily sprayed and poured bleach over them. 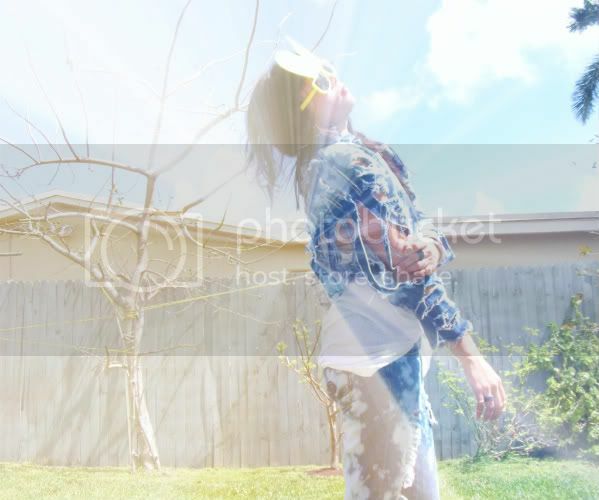 i sweat balls with this jacket while chilling out in the backyard. florida sun was brightly out and might thought i was a fool sunbathing with my jacket and jeans. these slashed denims are my new love. i should wear either one though it's terribly h.o.t. i gave my jacket a little rest and hang-out with this beat up vest. AHHH OH MY GOD I LOVE YOU. that jacket and those jeans are BEAUTIFUL! I am so jealous! I may even try something like this! anyways, LOVE IT. so much. definitely going to try slashing up a pair, but maybe without bleach... not sure i can pull it off. That's insane! I love how you did both the pants and the jacket. omg!! wow it is soo....ahh amazing!!! gREAT!!!! wow you made those dnime yourself ? great! that whole outfit is killer! i love it! Oooh, gorgeous girl, this is fabulous! I love how destroyed it is. Love the rips, love the slashes and love the dye job! Just found your blog, and I must say...its ROCKS big time! Also, I've been set on getting me a pair of slashed jeans (possibly attempt a DIY), and this post is definitely inspiring me to do so. Thanks for that. Fantastic DIY - love the jeans!!! would love to! cool denim! 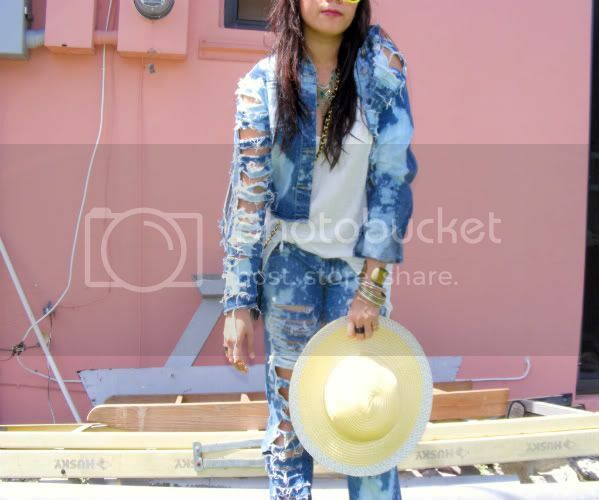 I love the slashed up texas tuxedo. Of course I would like to exchange links. I've added you right now! WOW, this outfit looks so 90s ! Really love it ! 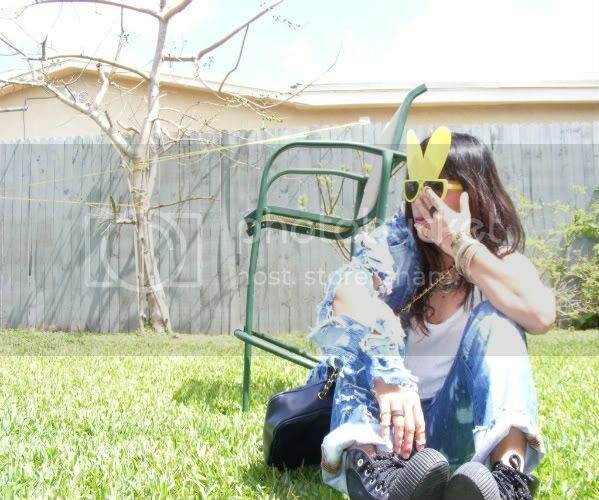 how i envied those DIY slashed jeans. mr. freddy thanked you. he's happy to hear you did like his slashed jeans...and i let him show your DIY. oh boy, now he wants to have a slashes denim jacket. You are so badass! This rocks! wow thats super rad. you make me want to experiment with bleach now. yeah ill totally exchange links with you. ill add u to my list, plz do the same. thnx!! Everything down to your bangles are perfect! Love the rawness of the jacket and pants! what can i say, but you rock the pants!!!!!! that's some pretty intense denim! ohh wow. you look so jeans blue cool. They've really turned out perfectly - I love how one leg of the pants is more slashed than the other! you are rocking this, too much fun! love the destroyed acid wash denim! So perfect. ROCK AND ROLL =D That looks amazing! You got some style! Love your blog. hollly mols. this is scary! but soo cool. i am so glad the whole bleaching thing worked out for you! I tried this a few months ago and the dark jeans DID NOT bleach right. they turned orange. i threw them in the dumpster. so sad! and thanks for visiting my blog! I actually really love that! I'm going to do that right away with some of my jeans! I love your blog, too! Want to exchange links? Great oufit! Love the bag! Seriously so cool. no more words than that. Totally awesome! I love it's look esp with just the white tee and the bag. You are soo brave this looks sooo amazing!!! I love acid wash and i hate it when people cringe when i talk about it! omg. i absolutely love you!